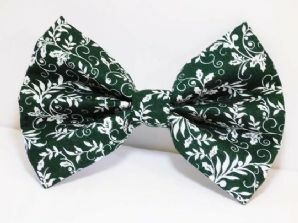 "Holly" what a wonderfully classy print... it's a beautiful holly print with leaves on a rich dark green. Matched with a green clasp, it's great for boys and girls alike. Although part of the Mabel & Mu festive range this is a design that will outlive Christmas & look just as fab in the winter months after. Small = 90mm wide x 60mm high approx. Medium = 110mm wide x 70mm high approx. Large = 130mm wide by 80mm high approx.